In Zulu, Johannesburg is called E’goli – place of gold – an epithet derived from the formerly productive gold mines found there. Today the city is a vibrant and unpredictable center of commerce and industry, where chrome and glass skyscrapers coexist with makeshift shacks of scrap. Best-kept secret: Try restaurants in Sandton. Beautiful places approximately 2.5 hours from Johannesburg – for example Entabeni, Sun City, Pilansberg or Panorama Route. Advice: Do not go outside after dusk. Use only hotel taxis reserved in advance, even for return trips. Advice: Lock or seal your luggage when traveling by air. Country dialing code: 27, all local numbers must be preceded by the area code (011). Population: 2.5 million (city); 7.3 million (Guateng Province). Ethnic mix: 72% black, 17,4% white, 10.2% Asian and other. Religion: 90% Christian, 4% Jewish, 3% Muslim, 2% other, 1% Hindu. Time zone: GMT + 2.
http://www.fodors.com/miniguides/mgresults.cfm?destination=johannesburg@81 – an expedient and easy-to-follow site that offers tips for everything from hotels to safaris. 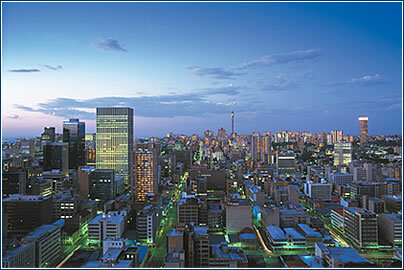 http://www.bootsnall.com/cgi-bin/gt/africatravelguides/joburg/ joburg.shtml – links to articles about Johannesburg, for the “independent traveler”. http://www.economist.com/cities/citiesmain.cfm?city_id=JOH – here’s you’ll find The Economist’s take on the only African city to be featured on its site. http://www.worldexecutive.com/cityguides/johannesburg/ – an excellent “hotels and city guide” for the executive traveler. · Despite the continuing negative influences of the apartheid economic policies of the past, a high crime rate, a low gold price and soaring oil prices, South Africa still has the strongest economy on the African continent. Gauteng Province, of which Johannesburg is the capital city, contributes over 40% of South Africa’s GDP, while covering only 7% of its area. 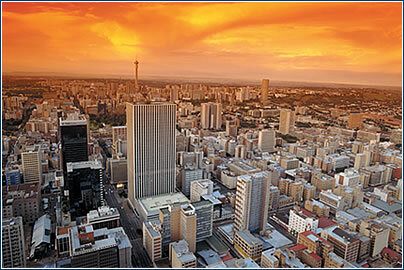 A sophisticated “first-world” economy is epitomized by the JSE (Johannesburg Securities Exchange), which ranks tenth in volume trading in the world. A struggling third-world economy, however, coexists alongside, as exemplified by the large squatter-settlements in the city. · Through its GEAR (growth, employment and redistribution) policy, the South African government has shown its commitment to privatization, free trade and the fostering of a favorable investment climate. The tourism sector’s contribution to the GDP of South Africa (presently around 11%) continues to be undermined by crime. Probably the best way for one to become familiar with business practice and opportunities in the city is to contact the Johannesburg Chamber of Commerce (founded in 1890) and Industry (JCCI). Their website (www.jcci.co.za) is reliable, authoritative and informative. Links to Johannesburg’s top ten corporations can be found online (www.corporateinformation.com/zacorp), while the City of Johannesburg also publishes its procurement needs online (www.joburg.org.za). · South Africa has 11 official languages, although English is the most widely used language in government and commerce. Normal business hours are 8am-5pm, although not much happens after 3pm on Fridays. · Businessmen and women in Johannesburg tend to wear suits, although ethnic outfits are increasingly evident. It can, however, become very hot during summer and bitterly cold during winter in this part of South Africa, so this should be taken into account – lightweight materials in the warm months (October-April) and heavy overcoats for the cold period (May-September). · Punctuality is still highly prized and it is advisable to address hosts as “Mr” or “Ms” until requested to use first names, which usually happens soon after formal greetings are dispensed with. Business cards are often exchanged where businesspeople meet informally, such as in hotel lobbies, airport lounges and at product launches. Gifts are not expected in either business or social situations.